With websites attracting significant traffic from mobiles and other small-screen devices, having a great mobile experience has become a prerequisite. 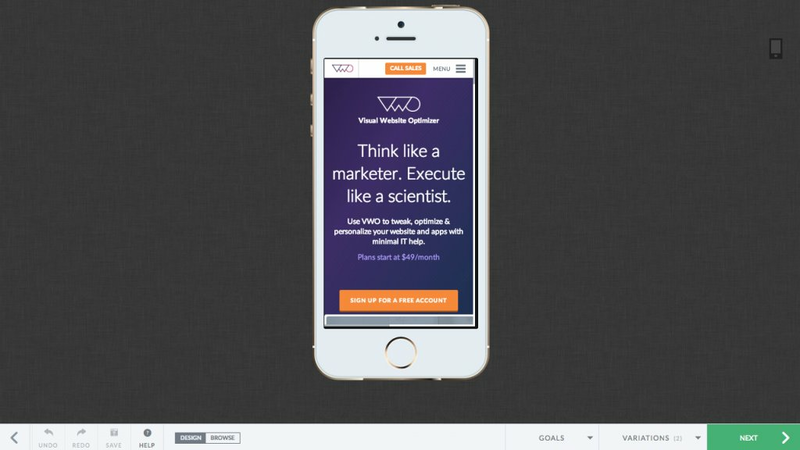 With VWO’s Personalization, it’s easy to optimize your website for mobile. You can target your mobile and tablet users and show them a personalized variation of your website where you have hidden the content which isn’t suited for mobile. By reducing or removing the content that makes navigation difficult, you create a better user experience..
Start by identifying which page receives a lot of mobile traffic. This could be your home page or some other high value landing page. Check out this page on your own mobile device. You can also search for mobile simulators online which let you load the website in your browser while simulating popular mobile environments. Review the experience. Look for problem areas such as overlapping content or hard-to-navigate widgets, etc. Make a list of all the issues. Now try to identify content which isn’t critical and can be hidden for mobile (such as pop-up widgets, feedback forms). The lesser the content, the easier it is to keep a user’s focus on the important stuff. PRO-TIP Once you are comfortable with Mobile Optimization you can A/B test hiding and showing specific content on specific pages and its impact on your conversions. On the navigation bar, go to Personalization under Target and then click Create. Enter the URL of the page you want to personalize for mobile. By clicking Advanced, you can include or exclude more pages for the test. Under More Options, you can restrict the test to run for a certain segment of your traffic. If you have a mobile or a responsive website, select Load campaign pages on mobile device. VWO will resize and load the website as it would load on the actual device you selected. You can edit the interface using the VWO point-to-click Visual Editor. If the website URL changes on the device, VWO automatically updates the test URL to the new URL. For example, if you create a normal test on www.example.com and then switch to the iPhone device mode, VWO will automatically update the test URL to the mobile website, such as www.example.com/mobile. You can now make changes to the website and create variations. To learn how to create variations and further steps in a test, click here. PRO-TIP To run your test only on mobile devices, you will have to explicitly segment it for mobile visitors. Click here to know how to target your test to a segment. What Are Saved Segments in VWO?